Since the early 70s, data management played a central role in organizations and represented a challenging area of research. A number of languages have been proposed to model, query, and manipulate data, as well as for expressing very general classes of integrity constraints, inference procedures, and ontological knowledge. Such languages are nowadays crucial for many applications such as semantic data publishing and integration, decision support, and knowledge management. In this tutorial we first introduce Datalog, a powerful rule-based language originally intended for expressing complex queries over relational data, and that today is at the basis of languages for the specification of optimization and constraint satisfaction problems as well as of ontological constraints in data and knowledge bases. 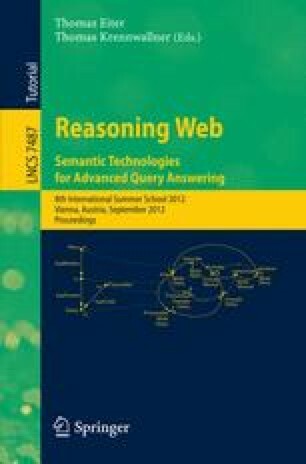 We then discuss the limitations of Datalog for the semantic web, in particular for ontological modeling and reasoning, and we present several extensions that allow to capture some of the ontology languages of the OWL family, the standard language for semantic data modeling on the semantic web.